It's actually International Literacy Day today (8 September), but given how often in the case of multilingual societies statistics on literacy are not clear on what they are measuring and assuming, I'm taking liberty with the title of this brief post. Recalling how often one encounters or hears of people schooled in Africa - and literate or even highly educated - who say they cannot read their first language, it is worth asking why literacy for polyglots is not more often multilingual literacy. The technical term for this is pluriliteracy (multiliteracy seems to be more often used for ability to read and use diverse media). 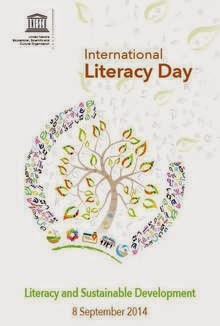 First, the theme of the 2014 observation of International Literacy Day - "Literacy and Sustainable Development" - highlights an important link. Literacy isn't just nice to have, but fundamental, and this bears reiterating. Second, my initial comments above come from a long interest in the subject of multilingual literacy or pluriliteracy, especially in Africa. I found it striking that people could go through extensive schooling without ever seeing their maternal languages in print, or learning established (even if historically recent) rules of orthography for them - and then to read discussions of literacy in societies in which these people grew up described as a single thing (as if we were talking about literacy in a monolingual region of the US or China). A regional news summary on the UNESCO site entitled "Celebrating International Literacy Day 2014 in the Sahel countries," for instance, lists many activities, but only in Burkina Faso is there any mention of which languages were involved: "articles related to literacy in French and local languages." What approaches to adult literacy and basic education for children work best on the countrywide, community and individual levels in multilingual societies? Should measures of "literacy" (% literate) be more complex in countries or communities where multiple languages and maybe even scripts are used? What other issues arise with various approaches to literacy in countries where many languages are spoken (e.g., language survival, national unity, prioritizing limited education resources, production of materials for post-literacy, role of ICT, meaning of literacy to the people...), and how can they be addressed?